Rich joined Northwest Vision Center in June of 2004, bringing with him 23 years of experience in the optical field. He began his optical career after successfully completing the two year Optical Services program at Fort Hayes Career Center in Columbus in 1981. Following that, he worked at Select Optical fabricating lenses for glasses. Rich did everything from grinding and polishing the lenses, to cutting the lenses to fit the frame. He also inspected the completed glasses for accuracy and quality. After that, Rich worked for R. H. Burton, where he reconditioned and repaired many of the instruments used by Optometrists and Ophthalmologists during an eye exam. Rich also has experience as an optician, working for Optometrists in Massachusetts, Tennessee and in Ohio. 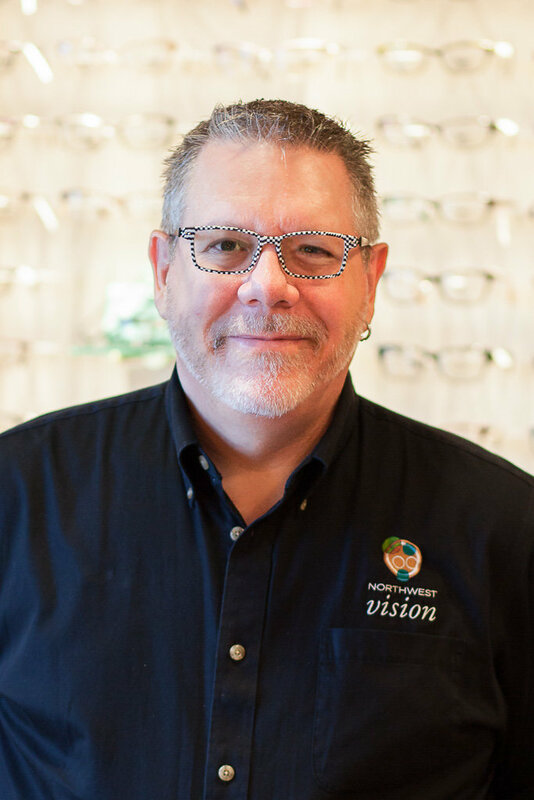 Rich became a Board Certified Optician in October 2005, and enjoys working with patients in helping them select the right frame and lenses for their individual needs. In his spare time, Rich enjoys attending OSU hockey games with his wife, Mary. Rich lives in Galloway with his wife Mary and black lab, Angus, and two kitties, Cricket and Maddie.